Julie Vermeer and her husband, Jim Vermeer, are partners in Vermeer Glass Art in Humboldt, Iowa. They exhibit their work at several juried art shows annually and participate in arts festivals throughout the Midwest. 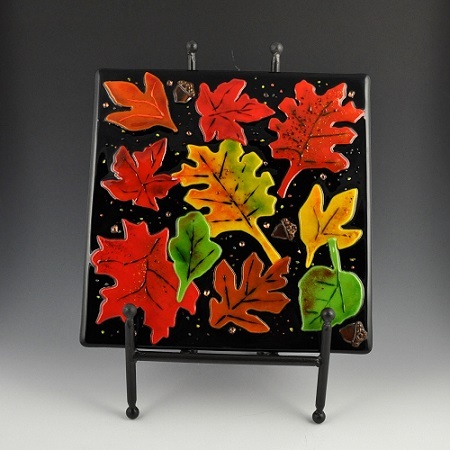 Julie started working with glass approximately eight years ago. Her husband explains that "we each have our own style. . . . Julie's work has more detail, texture, and depth." Fusing art glass provides us with the freedom to experiment and manipulate glass by color, texture, shape, and how a piece will be used, be it a functional serving plate, platter, bowl, or a decorative piece of art. There are infinite possibilities when fusing with art glass that can be very exciting and challenging. Magic is the only way to describe what it's like for us to fuse art glass. When a glass piece goes into the kiln for firing, its appearance is how it was assembled. But. . . after firing and opening the kiln, the kiln gods have given a gift which may or may not bring forth an "Ahhhh!" We take great pride in our handmade fused art glass and we enjoy the creative process involved. We hope you like what you see and find that one special piece for yourself, family members, and friends.